When depersonalization or derealization takes hold of you, it becomes difficult to think clearly. You may have told yourself that the next time intense depersonalization or derealization hits you, you’ll remain calm, accept and embrace the feelings, and not react with fear. But the minute these feelings surface, you forget all of that and do exactly what you said you won’t do: react with fear. Let’s try to unravel and see why this happens. When you are going through depersonalization, its intensity tends to vary over the day. Many people experience intense DP during early morning after they wake up. As they go about their day, they may experience one or more intense episodes and generally by night, they are able to calm down. For a few others, it may be the opposite, where the intensity peaks at night. When the DP intensity peaks, the amygdala (a region in the brain responsible for threat detection) is activated. It judges that this change in intensity as a threat and initiates a sequence that ultimately results in the secretion of the hormone adrenaline in the blood. This sudden dumping of adrenaline in the blood is felt as panic, fear, and dread. Also, the amygdala in a depersonalized person is actually more sensitive than someone without DP. It is constantly scanning and sending threat signals even when there is no real threat. In this hypervigilant state, we are easily overcome with fear by just a small change in the way we feel or the way we experience reality. For the most part, we do not have control over this sequence of events. We cannot instruct the amygdala directly not to issue a threat alarm when we experience depersonalization or unreality. But we can retrain it to stop treating these changes in DP intensity as a threat. To do that, what really matters is how we react once this initial threat sequence is finished. When adrenaline has been dumped into our bloodstream, we experience a lot of fear. After that initial pang of fear, we react to it with more fear. We instinctively now add more fuel to the burning fire. To prevent this fear-feedback cycle, we need to not react with more fear. We need to accept this initial fear and ride it out. However, in the midst of panic, we become confused and cannot think straight. Our rational, thinking part of the brain gets over-ridden by the emotional brain, which always seems to make us react with more fear. We feel as if we are unsafe, and without having this feeling of safety, we spiral into panic. As mentioned above, in the midst of fear, we do what our instincts tell us to do. Our instincts tell us there is danger, and it wants us to either fight these feelings or be afraid of them and try to run away. Both of these strategies fail miserably. So we need to find a way to remember that we are safe and know how to react properly. For this purpose, I’d advise you to carry what is called a safety note. It’s nothing other than a piece of paper that has a few bullet points written down, that you carry all the time with you. It reminds you that despite the intensity of DP/DR feelings, you are ultimately safe. It tells you not to react with more fear. Remember, in the midst of fear, you forget what to do and get caught up in the fearful thoughts in your head. Having some direction in the form of written points on the safety note comes in very handy during such intense times. I’m going to help you make this safety note. You can make it as fancy as you want, but in essence, you need nothing more than a piece of paper and a pen. On a piece of paper, write down 5-7 points that you think will help you stay grounded when DP/DR gets intense. Here are some example points that have worked for me and my clients in the past. Feel free to use them or modify them in a way that speaks to you personally. Pick something that speaks to you. Re-write them in a way that feels more personal. I have the inner strength to handle all these feelings. I have a loving family who supports me and cares for me. This too shall pass; my suffering is just temporary. I have survived every bad day before this, today is no different. I am willing to embrace this uncomfortable feeling and not react with more fear. These feelings are nothing but a result of hormonal imbalances in my body. I am moving the awareness from my mind to my body and experiencing these feelings as raw body sensations. I accept and surrender to this experience. I won’t believe all the scary thoughts in my head right now. Instead of fighting the depersonalization, I’m going to try to embrace it. Instead of running away from these feelings, I am slowly walking towards them. The universe will not forsake me; it supports me and wants me to succeed. I trust in God. He/she/it will not forsake me. My body and my mind know how to heal. This healing might take time, but I will eventually get out of this. There is no such thing as unreal, everything in this world is real. 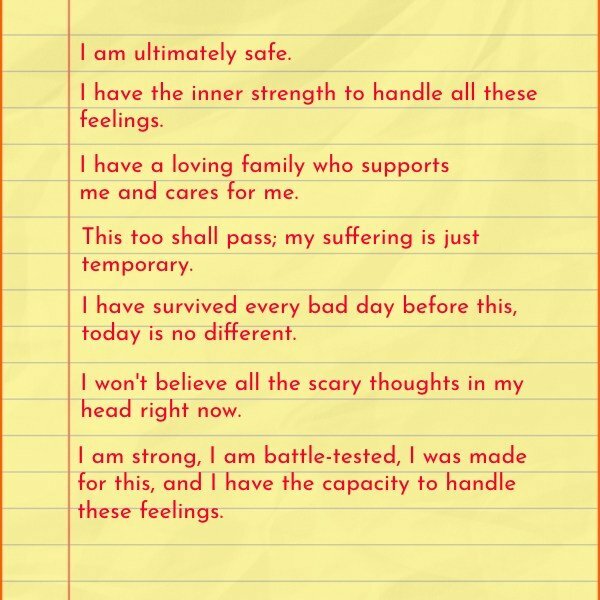 I am strong, I am battle-tested, I was made for this, and I have the capacity to handle these feelings. Pick whatever you like, how many ever you want. Note them down on a piece of paper. Decorate it if you’d like. Next time, when the intensity of DP/DR gets high, pull this safety note out and read each line carefully. When you read a line, think about it, understand what it says, and carry out the instruction if it contains one. For example, if you have written down: “I am moving the awareness from my mind to my body and experiencing these feelings as raw body sensations,” try to actually move your awareness to your body. If you have written down “I won’t believe all the scary thoughts in my head right now,” then realize that whatever scary thought that is going through your head is false. If it’s something along the lines of “I have the inner strength to handle all these feelings,” then take the meaning of it to your heart. 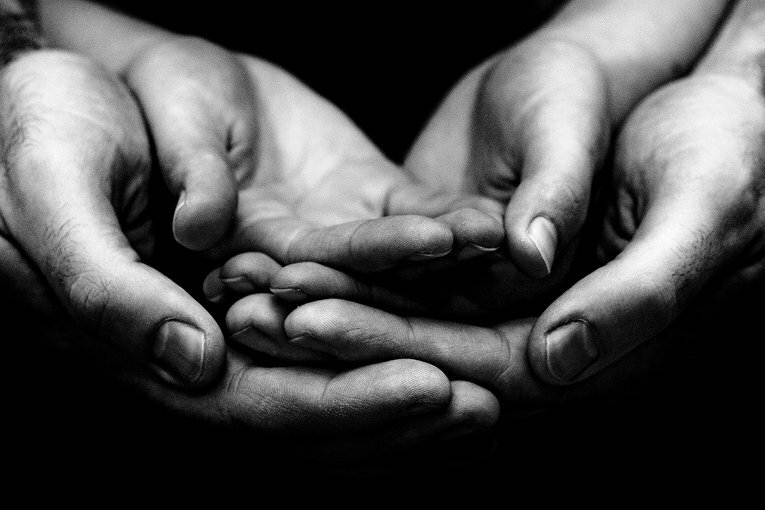 Close your eyes and imagine being strong and capable of handling these intense feelings. It’s important that you do this as part of your daily practice. You can do this even multiple times per day, whenever you feel that the intensity of the DP/DR is high. Carry this safety note in your purse or wallet. By doing this, we are retraining our body and mind to not react to the initial wave of fear with more fear. When the intensity of DP/DR is high, by using the safety note, we are learning not to engage our emotional brain but use our rational brain instead. Doing so cuts off the fear feeding on more fear-feedback cycle. 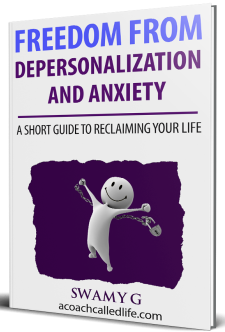 Over time, you’ll slowly start to recover from depersonalization and all its related symptoms. Try this for yourself and let me know in the comments what your experience was like.